Reference number for this case: 2-Oct-54-Vatan. Thank you for including this reference number in any correspondence with me regarding this case. The seven concordant testimonies of the workers of a quarry in Marcilly-sur-Vienne who, on Thursday, around 4:30 p.m., saw near them a mysterious craft and its passenger, intrigued the people of the region. We were able to interview Mr. Georges Gatey, chief of the building site and main witness of the event, as well as his six comrades. We report the impression that these men are sincere and trustworthy. Their statements, they confirmed them Friday and Saturday to professional investigators who did not fail, in their turn, to be impressed by the emphasis of sincerity of the witnesses. Mr. Gatey and his five workers were busy pulling sand and gravel from a quarry near the road near Marcilly. Everyone was at his workplace, some with a mechanical shovel, others with a hoist. Mr. Gatey was on the sidelines, closer to the end of the quarry. He was the first to see the machine, a device of circular shape surmounted by a dome, apparently equipped with blades similar to those of a helicopter. The machine was standing motionless one meter from the ground, the blades turning very rapidly. It did not land on the ground. Wearing a helmet of opaque material on the head, resembling scrambled glass, dressed in a combination of neutral tone, booted with booties, it stood next to it. He had in his hand a kind of big revolver or a pipe, and on the chest a very brilliant disc, emitting a jet of intense light. No one in the quarry, which lies below several meters from the road and the surrounding grounds, had seen the apparatus arrive and no one heard it. Everyone was busy at work and the machines that worked at the same time were very noisy. the extraordinary machine and its occupant. "But my legs were cut," he said, "and I could not take a step, nailed to the ground certainly by the effects of the luminous ray emitted by the man. Mr. Gatey was at that moment about fifteen meters from the craft and two meters below. He saw it from below. The machine, it should be pointed out, was at the entrance of the quarry, on the edge of the excavation, 3 meters from the road. On this road came a truck which came to get a load at the quarry, driven by M. Amirault, who saw the quarry men look towards the entrance of the shipyard, and he also looked. He saw "something gray" that was not there usually. This thing rose in the air. Mr. Gatey also told us: "The man climbed back into his craft without I being able to tell by where, and then the craft rose vertically in jerks and a noise like the jet engines Of fighter planes. At 200 meters of altitude, roughly, it emitted a fog that completely concealed it and disappeared before our eyes." "That's it," said the other witnesses of the scene. Moved to the vicinity of fear, then men tacitly shut up about their adventure of the afternoon when in the evening they found themselves in the small restaurant of Parçay-aux-Vienne where they take their meal. It was not until much later, around 7:30 p.m. or 20 p.m., that they decided to speak. "If I had been been alone, I would never have said anything about it," said Mr. Gatey, for fear of being the laughing stock of the country. The site supervisor had gone to the edge of the quarry to see whether the craft had left any traces. He hoped to find some burned grass but there was nothing like it, only the grass soiled and trampled by trucks. The 7 men, 6 of them at least being 30 years old, are sympathetically known in the area where they have been working for some time and there is no reason to suppose that they have attempted to set up a huge joke. Mr. Gatey drew from memory the silhouette of the craft and its passenger. His comrades, MM. René Rougier, André Beurrois, André Sèche, Georges Lubanowich and Maurice Dubrocs, in the presence of the sketch, affirmed: "It is this shape that the apparatus in question had." The craft could measure 4 m. 50 in diameter and 2 meters in thickness. It was gray. [en]terprise Goursault of Melle, came back to start their air compressor. Châteauroux, 3. - Mrs. widow Janiki, residing in the village of Le Cerisier, commune of Levroux (Indre), told the Gendarmerie that she had seen in the sky a luminous machine with a diameter of about 3 meters and which Was at the height of the buildings. Ms. widow Lacotte witnessed the same phenomenon. Mrs. Baron of Vatan (the Indre), said she saw last night a luminous ball in the sky. She alerted her husband, as well as about fifteen people from her neighborhood, all of whom saw the yellow-greenish craft rising and falling in the sky at a very high altitude. Nevers, 3. -- A representative of an insurance company in Clamecy and several residents of Corbigny said they saw an orange luminous disc moving in the sky. Several people claimed to have seen, at 300 or 400 meters from them, last night, around 8:45 p.m., a "flying cigar", at an altitude of about 50 meters. Mr. Anicet Corneille, an agricultural worker, said he saw a cigar-shaped craft 8 to 10 meters long by 3 meters in thickness last night in Comines; which evolved at about forty meters in height and emitted a sharp violet glow. Two bricklayers, MM. Romain Sebastiani and Buratto, both cyclist racers, said they saw a craft take off with a shrill whistle along the road from Blanzy to Montceau. In a written question, Mr. Jean Nocher, Deputy for the Loire, informed the Secretary of the Air about the emotion aroused in the public by the numerous and various testimonies concerning the "flying saucers". He asked him "if his predecessors in the Secretary of State for the Air had been concerned, as in the US and U.S.S.R., to open an investigation about the presence in our atmosphere of unidentified flying objects? "If so, he asks him to publish the results of these investigations, if not, he asks him to set up a committee widely extended to all the scientific branches concerned in order to study this phenomenon objectively." [Ref. le1:] NEWSPAPER "L'EST REPUBLICAIN:"
Chamonix. -- The chronicle of the flying saucers and other "cigars" continues to be abundantly provided. During the last weekend, the witnesses who have, indeed, seen mysterious machines are countless. It is apparently Chamonix which should be given the priority, since, at the same moment, officers of the high mountain school, gendarmes, and pilot Guiron who flew over the area saw during more than one hour a white shining craft move between the mount Lachat and Mount Blanc. Pilot Guiron said that, flying at approximately 2.000 meters above Faverges, he saw a craft which, he said, did not have any resemblance to a normal plane. Moreover, the direction followed at high speed by this apparatus excluded a sounding-balloon. In Corbigny (the Nièvre), several inhabitants saw a luminous disc of orange color which moved in the sky and disappeared vertically after having changed altitude several times. In Breuil-Chaussée, in the Deux-Sèvres, Mr. Girardeau, 55 years old, went to his work when, in a turn of the road, he noticed a circular machine "close to which was a being which seemed to him dressed in a kind of diving-suit". The "being" moved towards him and Mr. Girardeau fled, frightened. A little later the circular machine went away at high speed! "You would have said a haystack"
It is also a curious machine around whose two odd individuals wandered that two young people people of Vron (Somme) stated to have seen. "We approached, they entrusted to the gendarmes. A haystack you would have said. Suddenly, the machine took off". In the Indre, as well in Levroux as in Vatan, about fifteen people lengthily followed the moves of a luminous ball of yellowish color which went up and down in the sky and could have been three meters in diameter. Paris. -- The "flying saucers", which poison the Western skies whenever important international events occur, extend their field of action over the African continent. An official report to the Government of the Ivory Coast by the administrator of the Danane subdivision, 500 kilometers north-west of Abidjan, reported a "phenomenon" observed on 19 September, 8:30 p.m. to 09:05 p.m., by the said head of subdivision, Mr. Vernhet, his wife and Reverend Yvard, gathered in the courtyard of the Residence. It was a luminous spot surrounded by a halo which at first grew rapidly, moving towards or away from the horizon. The witnesses saw the machine lighting a powerful headlight, sometimes directed upwards, sometimes downwards. The ovoid-shaped craft was surmounted by a cupola, and light rays seemed to be detached from each side. When it disappeared after half an hour, the witnesses saw clearly - according to the report - two halos of light, oval in shape, forming at the presumed location of the craft which moved without any noise. The same day, at Soubre, 250 kilometers north-west of Abidjan, similar phenomena were observed by the head of subdivision. In France, flowering flourishes, passing through all forms of flying crockery: in Corbigny (Nièvre), it is a luminous orange disc moving vertically; in Breuil-Caussée [sic] (Deux-Sèvres) it is a diver mounted on a plate that scared an employee of the center of slaughter; in Vron (Somme), it is a millstone around which strange individuals prowl and flies away; in Levroux (Indre), it is a luminous machine 1 meter in diameter that is spotted "at the height of the buildings" by two widows of the area, and in Vatan (also in the Indre), it is a ball that 15 people see dancing like a dancer. In Milly-la-Forêt (S.-et-O.) it is a half-moon surmounted by a ring that appears to a restaurant owner. Finally, on Monday in Chamonix for more than an hour, the officers of the high mountain school, many gendarmes of Chamonix and a pilot specializing in high-altitude flight flying over the region at that time followed the moves of a brilliant machine of bizarre form between Mount Lachat and Mount Blanc. If one addresses the most qualified scientific circles, there are two attitudes: that of refusing to answer on the pretext that the problem does not exist and that of critically examining the published testimonies and to provide public opinion, confused and excited by the Press, the positive element allowing to recognize the natural phenomena. This latter attitude is that of Professor Evry Schatzman, a research fellow at the Institute of Astrophysics and a lecturer at the Sorbonne, to whom we have asked to enlighten our readers. "Is it true that scientists are beginning to take the flying saucers seriously?" - I have never met any astronomer who believes the flying saucer stories [ast]. I have personally read many books on this subject, seeking to grasp the exact meanings of the testimonies reported. By admitting descriptions made in good faith - which is always to be doubted - it always results in a perplexity as to the elements that can be drawn from it. In the majority of cases they are incomprehensible: the precise hour, the duration, the exact direction of the "phenomenon" is not known, nor even if it occurred by day or night. Or they are made unreliable by details that cannot be distinguished. And they are reported with the intention of making believe in the mystery. When one has a precise and complete description, one can do what is at stake and which can make illusion for the heated imagination of a public knowingly deceived for commercial and political purposes. - Can you describe such phenomena? - The list is long and not yet exhausted, because it is necessary to take into account still unknown atmospheric and meteorological phenomena. Among the phenomena which may give rise to misunderstandings, these are the most characteristic, not to mention the "visions" prompted by the causes of popular anxiety, such as these parachutists spotted by artillerymen in May 1940, who every night shoot at... Venus! 1. The rising and setting of the planets (Especially Venus and Jupiter). 2. The "shooting stars" and the "fireballs": one tonne a day arrives on the earth. The light is produced by the heating of the aura on the meteoric trajectory. The smallest shooting stars visible to the naked eye are grains of matter of 1 milligram which vanish completely between 120 and 90 kilometers. Only the fast fall on the ground limits the complete destruction of the bolides, that a longer course in the atmosphere would also annihilate. 3. The phenomena of "parhelia", which give rise to false suns, together with halos, and which are explained by the presence in the upper atmosphere of hexagonal prismatic ice needles. The concentration of light rays (sun and moon) in calm air on these crystals produces luminous spots on the right and left of the sun or moon at an equal distance from the halo radius of 22 degrees 5. A halo occurs more with other suns or other moons, with a double angular diameter. "At certain times, depending on the cirrhus [sic] variation, the inside of the halo was very dark gray-black and the iridescent colors of the halo as bright as those of a beautiful rainbow, beyond it, a milky sky, slightly ocher, forming a magnificent contrast with the central part". 4. The high-voltage power line balls that serve as landmarks for aviators were recently mistaken for mysterious craft by cyclists who at night saw these balls swept by the lighthouse of an airfield. 5. Weather balloons from meteorologists. 6. Ball lightning: these are configurations that occur at certain thunderstorms, with a precarious charge balance. The object, which always seems to be at the speed of the airman, is, moreover, characteristic of the object situated at very great distances. - But is it not possible to scientifically design terrestrial craft comparable to the "saucers" seen here and there? No, for the great velocities of which the "witnesses" claim these "machines" are animated could only be reached in regions of rarefied air, at the limit of the atmosphere. The mechanical action of the air on their surface would soon have dispersed the molecules of the substance which they would be made of. 1. A scientific element: discussion of observations, explanation of natural phenomena, sociological explanation of the phenomena of collective hallucination [hal]. 2. A logical element: inconsistency of opinions and testimonies. Mr. Evry Schatzman has enumerated the phenomena of vision, false perception, and hallucinations which may explain the most precise and complete testimonies-which are a minor infirmity and always subject to caution. There is no scientist to take seriously the assumptions made by scientific writers, science-fiction specialists and members of the Pentagon [pol], who have also renounced the theory of extraterrestrial craft, as revealed in the last book by Mr. Keyhoe. The saucers museum is always empty of exhibits. And it is difficult to admit, if the "saucers" are terrestrial craft, that we never collected a single fragment [fra], never heard the supersonic detonation [sup], nor ever observed a perturbation in the air. [pol] Like many other French scientists of that time, Evry Schatzman was a Marxist, with an devotion to the ideology of the USSR. It had been claimed in these circles that the "saucers" were "political", that is, the "Pentagon" used them to make people anxious, whereas Communist countries would not do such a thing. [est] It is totally false that there were no "saucers" in the Communist countries. Read Boris Shurinov, Felix Zigel, for example. [mir1] It must be understood that the mirages on the ground do not make appear "saucers" nor "spacecraft". [mir2] Evry Schatzman believed correct the ideas of the "skeptic" American astronomer Donald Menzel. They are without foundation on this matter; there has never been anything like a "luminous mirage in the sky". What can happen is a refraction of radar waves, detecting objects on the ground (truck, boats) and then showing them on the radar screens - but with the speed of movement and the trajectory of the truck or boat... The radarists of the time had to recognize them as such; later, these "false echoes", these radar returns of slow objects on the ground were filtered electronically so thatthe radar men did not have to bother about them anymore. [sup] It is the French scientist Jean-Pierre Petit who later showed how even with our already known technologies (MHD), it would be possible to suppress the sonic boom. The argument could stand in 1954, it should no longer be used. [fra] There is no shortage of cases with "fragments"; certainly often debatable if not debunked. The museum of the saucers remains to be built, no one having ever been concerned to preserve correctly the most intriguing fragments. [hal] Mistakes are obviously not "collective hallucinations", the journalist does not seem to understand. Misinterpretations and collective misinterpretations exist, "collective hallucinations" simply do not exist. The problem is very rarely a "false perception", it is often a "false interpretation". 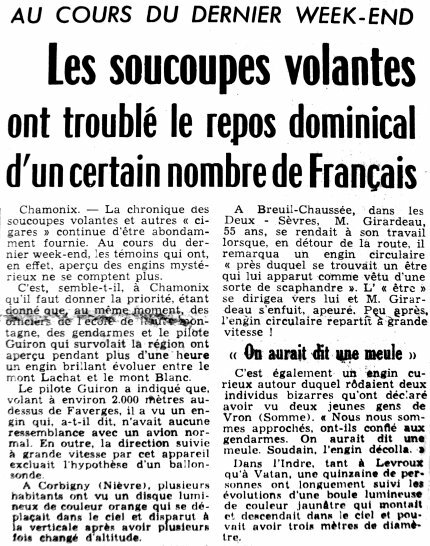 Aimé Michel reports that there was a sighting on October 2, 1954, in Vatan, France, moving "towards Châteauroux" i.e. the Southwest, at some hour between 7 and 8 p.m.. In his 1997 book on the 1954 French flap, UFO researcher and author Jean Sider notes that Mr. Desbois, investigator member of the private ufology group Lumières Dans la Nuit, who has done counter-investigations on a number of french UFO reports of the year 1954, has investigated a case of October 2, 1954, at 07.00 P:M. at Vatan in the Indre, and that he could not find any trivial explanation of that case. Luc Chastan indicates in his database that in the Indre in Vatan on October 2, 1954 at 19:00 hours: "Observation of an object in the shape of vertical cigar. It moves away to Chateauroux i.e. towards the Southwest." [nr2] Article in the regional newspaper La Nouvelle République du Centre-Ouest, France, October 4, 1954. [le1] Article in the regional newspaper L'Est Républicain, Nancy, France, October 5, 1954. [pv1] Article in the regional newspaper Le Petit Varois, Toulon, France, page 8, October 6, 1954. [am1] "Mystérieux Objets Célestes", book by Aimé Michel, Seghers publisher, France, pages 148,150,152, 1976. [---] Investigation by Mr. Desbois, of the LDLN (Lumières dans la Nuit) ufology group, France. 1.0 Patrick Gross February 27, 2009 Conversion from HTML to XHTML Strict. First formal version. Additions [am1], [lc1]. 1.2 Patrick Gross July 29, 2010 Addition [le1]. 1.3 Patrick Gross January 2, 2017 Addition [ub1]. 1.4 Patrick Gross January 11, 2017 Addition [nr2]. 1.5 Patrick Gross February 17, 2017 Addition [pv1]. This page was last updated on February 17, 2017.